Krishnam Raju is planning his dream project Visala Netralu for a long time. He is planning to direct this film with Prabhas as hero. There would be two more vital roles in the film out of which Krishnam Raju is going to don one. He is planning to approach ANR for other character. 100 days function of Prabhas’s latest blockbuster Chatrapati will be held on 14th of this month at Lalitha Kala Thoranam at 5 pm. Chatrapati ran for 100 days in 54 centers. 100 days function of Prabhas’s Varsham was also held at the same venue in the past. Ileana is doing the female lead in Prabahs’s next film Munna. This film will be produced by Dil Raju on Sri Venkateswara banner. Vamsi who worked for films like Varsham, Bhadra and Mass is being introduced as director. Shooting of this film will be commenced on 25th of March 2006. 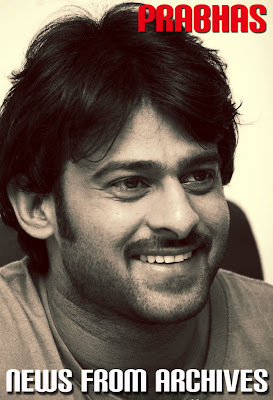 Shooting of Prabhas’s latest film Pournami is complete but for two songs. The remaining songs will be shot from 1st March. Introduction song of Prabhas will be shot in Araku valley and another song will be canned on Prabhas and Charmme in sets. Climax of this film was recently shot in Shamshabad. Trisha and Charmme are playing female leads. Producer MS Raju is planning to release the audio on 10th March and the film on 20th April 2006. Prabhudeva directs this film. Ramana Gogula who provided chartbuster music for the Sankranthi blockbuster Lakshmi is going to score again for VV Vinayak for his next film with Prabhas as hero. This film is going to be produced by P Ravindranath Reddy (Kadapa Mayor) on Eeswari Films banner. This film will go to floors on 7th April 2006. Audio of Pournami - MS Raju’s latest offing with Prabhas as hero in the direction of Prabhudeva - will be released precisely at 10:31 am on 22nd of this month. Devi Sri Prasad is expected to start his second inning with this film. There has been considerable gap for Devi Sri Prasad in Telugu now. Maruthi Music is releasing the audio. Dil Raju’s next venture with Prabhas as hero will be launched on 25 March. Ileana is the heroine. Vamsi who worked in direction departments for films like Varsham, Badra, Mass etc is going to make his debut as director with Munna film. Harris Jayaraj scores music. For the climax of Pournami, producer MS Raju hired few fighters from Thailand who are supposed to act as duplicates to Prabhas in risky stunt sequences. But Prabhas preferred to do it on his own by not allowing duplicates take over him. Peter Heins composed stunts for Pournami. This information was revealed by Rahul Dev in a press conference today. MS Raju’s latest film Pournami was screened to all Telugu film writers on the night of 14th May. An invitation was given to all the members of Telugu film writers association. This film was appreciated by the writers.